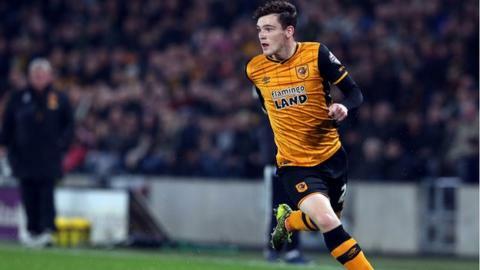 Scotland and Hull City left-back Andy Robertson is with the nation's Under-21 squad for their match against Ukraine on Friday. The 21-year-old former Dundee United was a guest on BBC Radio Scotland's Sportsound and discussed his career. Starting as a youth at Celtic and then moving on to Queen's Park, Robertson joined United in 2013 and made his senior international debut the following year. He soon joined Hull in a £2.85m deal. Below are some of the topics he discussed on Sportsound. "His enthusiasm always comes across to the boys. "He's one of those people who can easily pass on his enthusiasm to all the players." "They were all brilliant. [Celtic's] Scott Brown was up here [in Scotland] and he was the captain. He spoke to us and made us feel welcome. "That was us into training and you could just look forward to it. He really put any nerves that we had to ease. "The squad was really welcoming. When you see new boys coming in, we're all not scared to chat to them and make them feel welcome into the squad and I think that's the most important thing." "When you look at the league table and you see them bottom, it is tough to look at, especially with how well our team did when I was there and even the season after, they were always up trying to fight for Europe. "It's tough to see them at the other side of the league now. At the end of the day, the youngsters kind of got them success throughout the years even before I was there. "I think it's very easy for people to turn and say, 'yeah, they need experience and get the youth out the team' but I don't think that's the case. "I think they do need a few leaders and I know there is a few there like [John] Rankin and [Sean] Dillon. "I'd probably try my best to get the boys all pulling together and hopefully they can get a couple of results put together and start climbing that table." "Listen to your coaches. If you get a chance then take it. Luckily, I managed to do that. I didn't really look back from there. Other boys have done the same. "I would just say whenever you get a chance, you've just got to take it with both hands."